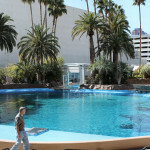 One steady source of publicity for the Mirage dolphin habitat is the influx of field trips throughout the school year, from the Clark County public school system, Christian schools, home schools, and more. Dolphinariums around the world use the education system as a way to mask the true business model; dolphin entertainment for profit. 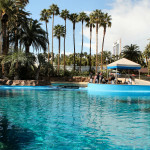 The Mirage dolphin habitat is located in the “backyard” of the casino property. Steve Wynn built a special entrance to shuffle the school children in without exposing them to the gambling and debauchery on the inside of his gaming floor. The public is not allowed onto the grounds until after the children have left. Once contained inside the facility, the children instantly become mesmerized by seeing a dolphin, many of them for the first time. They linger on the trainers every word, without realizing they are not being told the full truth. 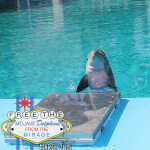 One anecdote the so-called educators at the Mirage love to repeat is “the dolphins do not perform tricks, these are natural behaviors”. They convince the children that the dolphins are not performing tricks because they are not pulling a rabbit out of their blowhole. Sound ridiculous? I couldn’t invent these stories if I tried. Just last month, the staff of the facility was caught on tape saying, “It’s our responsibility to make sure they’re as healthy as possible. That’s our main concern. You can’t do anything. You can’t do research, you can’t do interactions, you can’t do shows, you can’t do all those other things unless you have healthy animals and that’s a big thing for us“. The above video of the school trip shows otherwise. 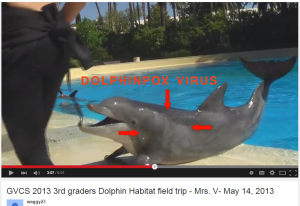 These dolphins are told to perform for school children while visibly suffering from a stress-induced illness known as dolphin pox. 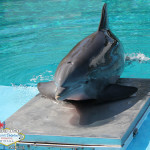 The Mirage dolphins have been displaying this illness for more than four years, after contracting it during a breeding swap with SeaWorld Orlando in March 2010. 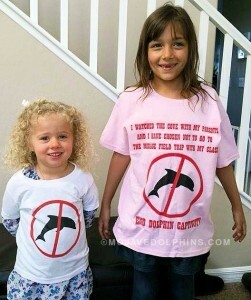 Children of all ages, from all reaches of the globe, are speaking out against dolphin captivity. 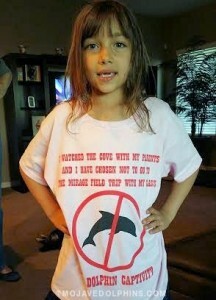 Phoebe Goldstein of Colorado convinced her school to cancel a trip to Seaworld San Diego. Dedicated dolphin activist Zach Affolter of San Diego petitioned his school board to remove school-related activities from occurring on SeaWorld grounds. He has continued momentum by supporting students within the San Diego Unified School District in their bid to change the way field trips and classroom studies involving live animals are handled. View his speech with the school board by clicking here. The resolution (which you can view here) was passed unanimously. UC Irvine student government stopped selling passes to SeaWorld along with California State University-Long Beach. Children from Point Dume Marine Science Elementary School in Malibu were successful in cancelling an annual trip to SeaWorld. Young children in Brussels took their love for dolphins all the way to the European Parliament. 5 year old Cash was so taken back after seeing a glimpse of Blackfish that for his birthday, he called for a protest of SeaWorld, that inspired demonstrations at all 3 American parks. Williams Elementary School in North Las Vegas created a video and a song to raise awareness about Orca Morgan trapped in Spain. 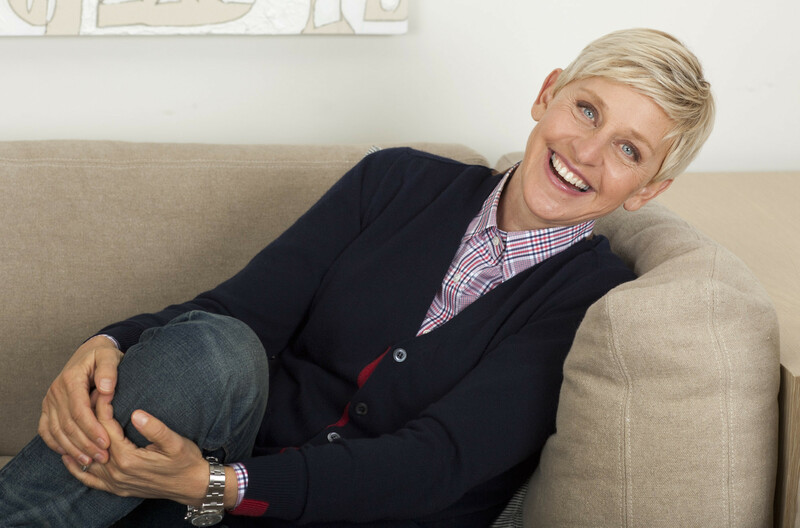 Dolphin Project Youth Ambassador Harry Morgan recently penned this letter to Ellen Degeneres asking her to stop promoting the Mirage dolphin habitat. Children are fascinated by dolphins, but do not need to see them in a swimming pool to appreciate the beauty they bring to this world. One young fan of dolphins recently stood up against her classmates here in Las Vegas after learning that her school would be taking a trip to the Mirage facility. She had seen “The Cove” with her parents and came to the decision that dolphins do not belong in captivity, especially in the middle of the desert she calls home. She will sit behind while her classmates are out in the Mojave sun, hopefully wondering why the dolphins have spots, or why it is so hot and the dolphins don’t have any protection from the burning sensation they are feeling on their skin. Once exposed to all of the facts behind the way dolphins are captured, trained,and exploited, children will open their hearts to the dolphins and call for their systemic abuse to end. 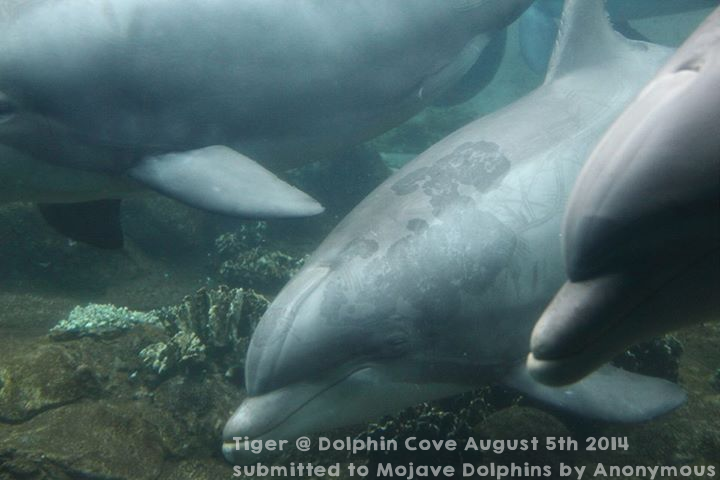 We are asking for the Clark County School District to review the information contained within our website, and to re-evaluate the decision to send children to the heart of the strip to learn about dolphins. If you are the parent of a school aged child in Nevada, please think twice about the message this facility is sending to your children. 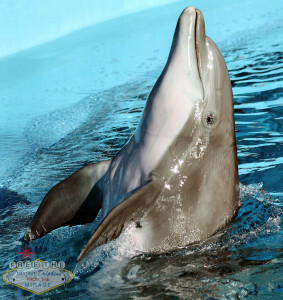 We visited the dolphin habitat for World Wildlife Day back in the beginning of March. The first thing we noticed when we arrived was a female dolphin, whom we believe to be Bella, repeatedly sliding out onto her scale. The facility had just opened to the public. There were no trainers present around the main pool. The dolphin continued to slide out onto her stomach, posing for a moment or two, before sliding back into the water. This went on for several minutes. 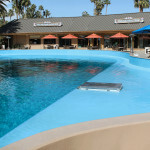 The first training session started in the center pool with Maverick and Beetle. Maverick was orally given a drug called Nystatin. They said he is given this antifungal for his lungs and airway. 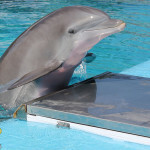 When an educator was asked about a shade structure for the dolphins, they replied saying that the dolphins are not effected by the heat or sun because they are kept in the water, which stays around 75F. Their go-to response seems to be that dolphins do not have any shade structures in the wild, so why would they need them in captivity? 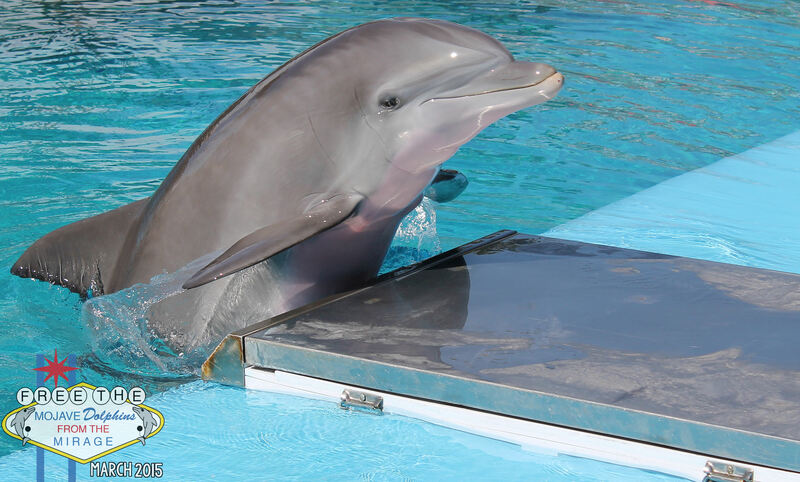 While at the Mirage, dolphins spend a vast majority of their life lagging at the top of the surface. 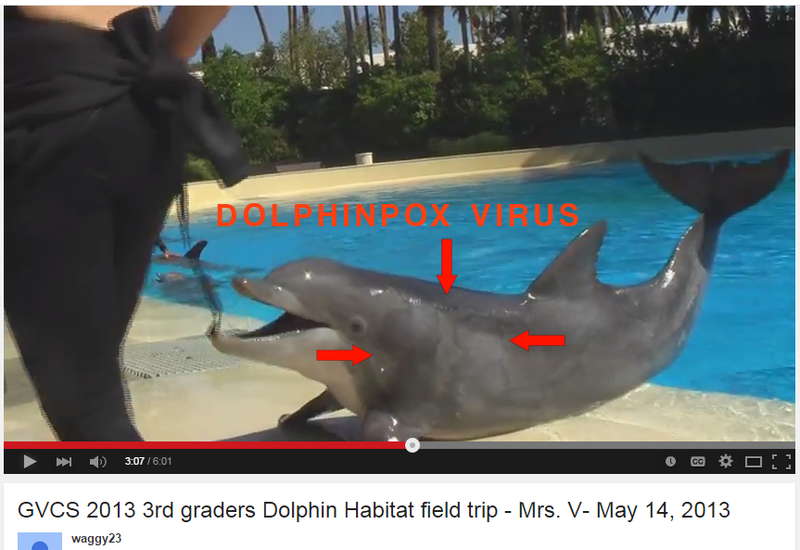 The sun is a problem for the dolphins because trainers have been seen lathering on sunscreen as seen in this video. Summer is rapdily approaching here in the Mojave desert. Mirage officials have refused every opprotunity we have given them for a meeting to discuss better options for the dolphins. They even turned down several requests to meet with Ric O’Barry. 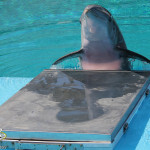 David Blasko, head of animal care at what activists refer to as the dolphin death pool, discussed providing the 10 dolphins with a shade structure during Ric O’Barrys visit to the habitat in October 2014. We were given a date in February for the confirmation of the shade, and that date has come and gone. 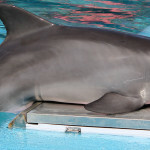 These 10 dolphins will probably spend their 25th summer with temperatures rivaling Death Valley, and no immediate relief. It is their belief that the trainers are the ones suffering, not the animals. 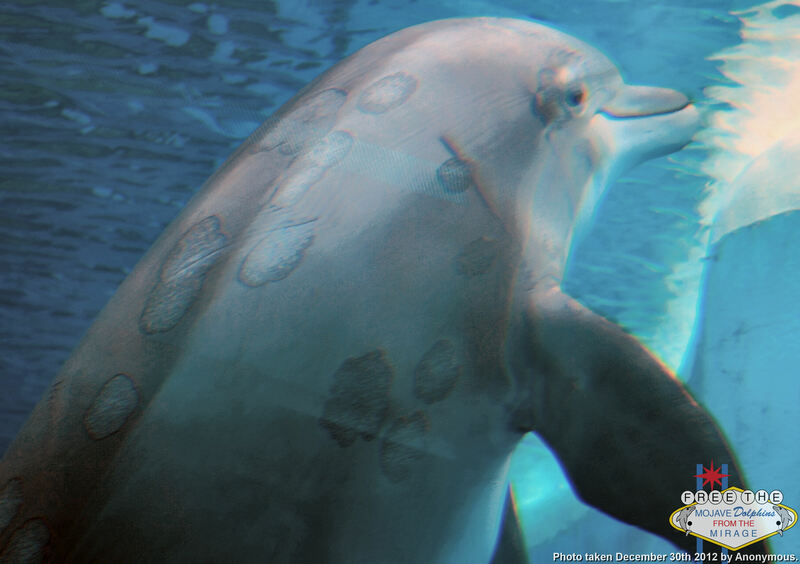 Multiple educators were asked about the life expectancy of the dolphins. Each one said that dolphins in captivity live a longer life than dolphins in the wild, but each educator gave a different age. If the science behind this theory was solid, the educators information would not dispute one another. 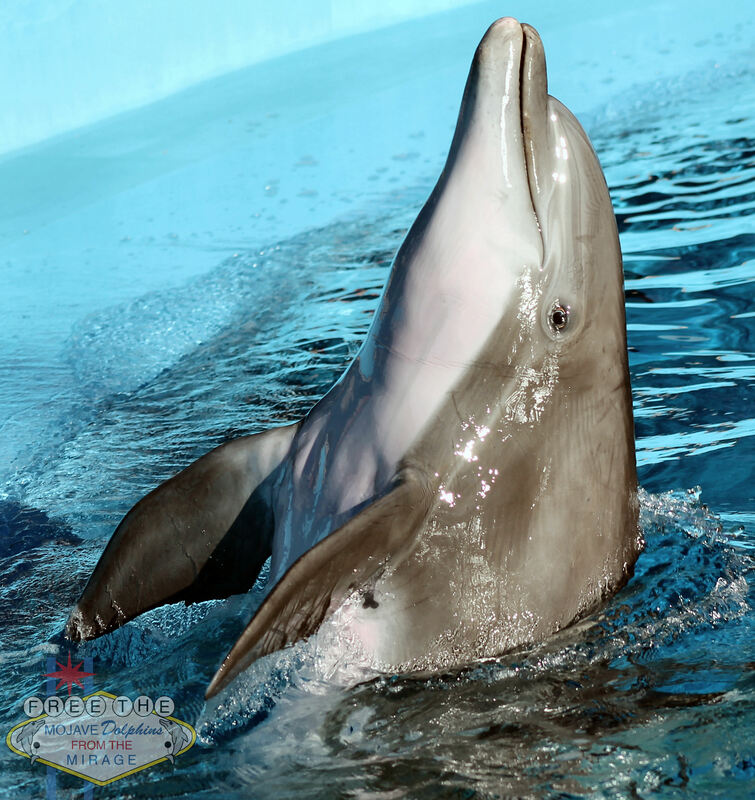 Listen to this video where an educator at the facility states the reason why Mirage employees respond with these numbers to the tourists looking to become educated on cetaceans. The primary reason the dolphin trainers at the Mirage are saying that dolphins are declining in the wild is due to human threat. 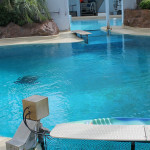 One trainer by the name of Philip has stated that he believes all wild animals should become captive animals. This knowledge is being passed onto the school children. 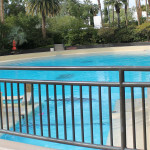 The underwater viewing area was filled with art work from grade school aged children who believe that the only way to save dolphins is to exploit them in captive facilities such as the Mirage. This facility needs to be on every anticap’s radar. 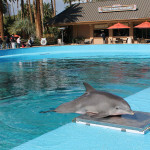 There is no reason to be breeding dolphins in the desert, allowing them to suffer from the pox virus for several years, and not following the Animal Welfare Act by providing the animals a simple shade structure. Mirage/MGM has the capital to build a shade structure by mid summer. They just do not want to cave into activist demands. They would rather get a bunch of bad publicity and allow animals to suffer. This is not right. 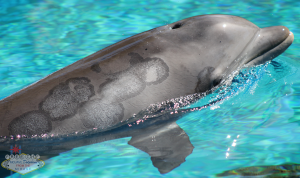 I just got back from the park, got you a few pictures of some of the dolphins with pox. A lot of them at Cove have it, some really bad. Out of all of the ones I laid eyes on for sure, there were only a handful that I didn’t see any marks on. Can they contract that disease from each other? I saw a small spot on the juvenile female Haley. She is constantly pursued by an older male, Lagos, who is one that has the pox pretty bad. So I was just wondering how it spreads, if it’s contagious, etc. I did not see any in Nursery that had it. But two, possibly three in the stadium (Baretta, Clyde, Marble) have it. I was not able to get great pictures of them but I got one that at least shows it on Baretta.